Nothing says summer like a road trip vacation. However, road trips can be a little more tricky when you are travelling with children. Kids can go from blissful happiness to the depths of despair in a split second. When your child is having a meltdown in the backseat, you will naturally feel the urge to turn around in your seat to help them. You must resist the parental instinct to help them and keep your eyes on the road until you can find a place to pull over. But fear not! 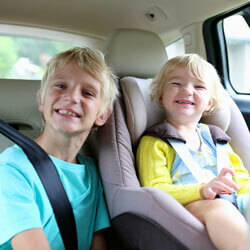 We have compiled a list of ten things you can do to keep your kids happy (and busy) in the car so you can drive safely. When travelling with younger kids, it's best not to drive more than two to three hours in one stretch. Any more than that and nature will undoubtedly be calling your kids. Even if your kids don't need to use the bathroom, they will start to fidget and complain. So it's best to plan your route ahead of time so you can prevent the "I REALLY need to use the bathroooooooom" complaints coming from the backseat. You will be able to break up the trip and have a definitive answer to the panicked question "How much lonnnnger?" from your cross-legged kids. Some road trips can last several hours (and even days) so you might as well be comfortable while doing it! Dress the kids in loose fitting, comfy clothing with options available to remove or add a layer with ease. Bring socks in case their feet get cold, and pillows and blankets in case there is a need for an imminent snooze. These pillows can also double as handy separators between two fighting children. Kids absolutely love to listen and sing along to fun music. Legendary children's music artists like Raffi and Sharon, Lois & Bram are still as great as ever. Even recent kids music bands such as the Imagination Movers have very catchy and educational music that won't drive parents too crazy. Of course, there are also popular film and TV soundtracks where the whole family can sing along. Nothing says "road trip" like a serious sing-a-long jam session. A big distraction for a parent driver is having to reach into different bags for various toys, snacks, and books. These distractions can be prevented by keeping these items in a convenient and easy to reach place. If the kids can reach what they want themselves then they won't need the driver's help; and if they do need the driver's help, pull over first. Also, keep any car-sick related materials (bags, buckets, napkins etc.) close by to minimize any unfortunate mess. With the recent rise of handheld gaming and technology, children have never had it better on road trips. Portable DVD players, gaming systems, laptops, and even cell phones can keep kids happy and distracted for hours on end. While we don't necessarily advise having kids in front of screens the entire road trip, these games and movies can give parents a nice break while keeping the kids entertained. The world is filled with "the grass is greener on the other side" kind of people and children are no exception. Kids, more than anything, want to be grown-ups. Nothing makes them happier than to let them help with "grown-up" tasks. Get them to help you pack bags, load them into the car, or even read the map or GPS. Let them order their own food at restaurants and get them to wipe the windshield clean during gas station stops. Any seemingly minor task that you can outsource to your children will be a big deal to them. Doing a good job will make them feel more grown-up, more involved, and most importantly keep them happy. There are tons of classic driving games that are fun for kids and parents alike. Classic games such as I Spy, Would You Rather, License Plate Games, Mad Libs, 20 Questions, and more can provide a lot of laughs and help pass the time. It is also a lot of fun to reminisce and tell stories. Ask your kids "What was the last day that you remember that was the best day ever?" Nostalgic stories can bring families closer together and instantly put everyone in a great mood. Many of the best kids books have audio versions. These are simple to purchase online, in store, or to find for free in most public libraries. Classic children's chapter books such as Charlotte's Web, The Hobbit, and many more will keep kids at the edge of their car seats. You can listen to these as a family or give the children some headphones to enjoy on their own. Combine many of the previous ideas into a fun hourly game! All you need is a quick trip to the dollar store and several little bags. Put different combinations of little toys, snacks, books, activities, and even DVDs into several bags. After every hour, the child will get to open a new mystery fun bag to occupy their time for the next hour. The kids will love the anticipation and suspense of wondering what will be in the next bag. Hours will pass by without the kids even noticing because they will be too excited to open their next bag! Road Trips! What's A Summer Without Them? A road trip is always a great idea, but before you pack the car and the kids remember make sure you've got all your car-related documents. If you're travelling across Canada or into the U.S., your car insurance coverage will follow you, just make sure you have your insurance documents plus your driver's licence, ownership and registration handy at all times. Also, make sure you have the travel health insurance coverage you need before you hit the open road. It's a must-have for adventures into the States, and is often recommended if you're leaving your home province.